DEEP WATER WITH BOAT LIFT-DOCK/JET SKI - 2019 Summer Deals! WATERFRONT ADVENTURE LITERALLY AT YOUR BACKDOOR! SUMMER FUN- SLEEPS 8-20 Guests. MEMORIAL WEEKEND STILL AVAILABLE! Water Sports Abound...Weddings/Reunions/Family GETAWAYS. LOTS OF WATER-Convenience-LOCATION-COMFORT! Boat Lift/2 Jet ski ramps at back door! (8 to 24 guest!) Lake LBJ is the largest (6,534 acres) CONSTANT LEVEL LAKE! Fed by the Colorado and Llano Rivers. 20 miles of calm, deep clear, water has become one of the most popular tourism destinations in The Texas Hill Country. This property is located in Horseshoe Bay RESORT on the Cape behind the Yacht Club/Marina within walking distance around Resort. GREAT CLEAN WATER! Marble Falls is located 5 miles away w/great restaurants, shops, wineries, music, caves, and other attractions are quickly accessible. My home is excellent for 3-4 couples, girl weekends, golf buddies, or family reunions. Pets considered BUT no Smoking! Call ahead for your shopping/supplies/boat rental/dinner reservations to start your vacation experience the minute you arrive. 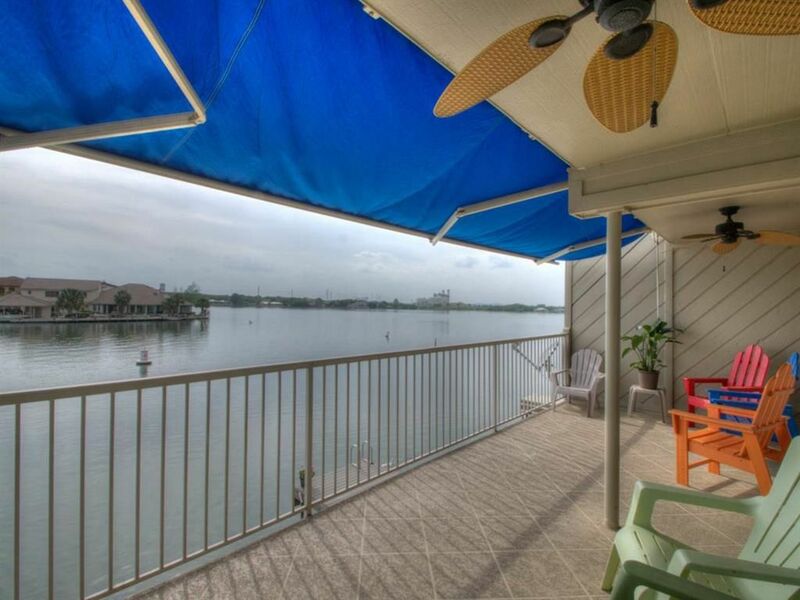 Furnished w/Chinese accents and 2 back patios on the water for instant swimming/skiing. 3 Patios for fun in the shade, FREE WIFI and WATER TOYS! Day Trip Activities: In the Highland Lakes/LBJ area as there is so much adventure besides relaxing in the sun or under our beautiful Texas stars at night. Resort lifestyle is all around you for a 'special holiday' along with day trips to Austin (Arts, Music, Sports, 6th Street), Fredicksburg (antiques, dining, wineries), San Antonio, (Sea World, Six Flags, River Walk, Museums), Greune (dining, music, water rafting/canoeing), or New Braunfels! (Antiques, Schlitterban Water Park, Dining). Local Activities: Lakes, hills, golfing, shopping... it's all right here for your day trips. Locally, as your personal concierge, I can arrange a massage on the patio for couples/grocery shopping/dinner reservations in the best restaurants, your power boat rental/party barge/jet skis, concert tickets, etc. I know all the best venues and wish to share them with you. I look forward to serving your family or friends upon your visit to The Texas Hill Country. Other Activities: There are 15 wineries in the area. Flower farms, farmer's markets, church services with fabulous views of the lake, aqua sports abound with marina & boat rentals, fine dining, music concert halls including a lot of 'Willie' and the Gang. Art, shopping, take a course in the culinary school in Marble Falls, golfing at over 23 different clubs. We have 'Wild & Woolly vacations for those that love Zip Line from 30-50ft through the air or tackling some outrageous off-road trails on motorcycles, four-wheelers! Something for everyone! BOOK-MY HOME..... BOOKS FAST FOR FALL FUN AND IT'S STILL GREAT WATER AND 1/2 PRICE!. Don't miss out! 'Texas Welcome' My home is the perfect location in the resort for fun, swimming, fishing, relaxing as well as just watching the sun set! Oh and the wineries & music! :) Shopping?? We have that too! My family loves to swim, ski and bbq out the back door all day and into the evening. Water is deep and we catch alot of fish! I am a Realtor in the Highland Lakes and would love to help you find your spot in this 'Constant Level Lake Playground' in 2018! Being a world traveler I can accommodate all you tourist and Texans with the best comfort, hospitality and caring in Horseshoe Bay or the surrounding area of Marble Falls/Highland Lakes or Lakeway, Texas! I am here because of beauty, music, arts, wineries, the food and the people of Texas. Ya'll come! All you need to bring is sunscreen & suits! Yes I have towels! Because I'm on the water! CONSTANT Water LEVELS and Pure Clean WATER! Jump in and your 10 feet deep. Electric Boat Lift at back door and 2 jet ski ramps. Fishing night light for evening fun or just enjoying the ducks day or night at the back door Walk along the Resort in the mornings and evenings. Beautiful landscaping, water and animals. Bring your bikes or roller blades. Private Gated Pennisular surrounded by water on both sides! Clean Linens, towels and beach towels provided. Park your car and walk around Resort & enjoy the beauty. Swim at the Quail Point Beach with your babies or tots under shade trees. Water for sports and swimming all at your back door. Just unpack and enjoy the home and WATER! View, location, water, and clean comfort are why you want to stay here. Convience and quiet yet in the middle of it all! If you don't have own boat or jet skis then there are several places to rent them. Some companies even bring them to you. ROOM FOR THE WHOLE GANG! Full bath in master bed - 2nd guest bed has full bath - Bunk room has 1/2 bath - Den has full bath & laundry. Welcome Kit: Shampoo/Rinse/Bath soap/Toilet paper new and fresh in each room. Two hair dryers. Laundry soap, beach towels, bath towels available. Kitchen has everything for baking cookies to gourmet meals. Always have salt & pepper/condiments/dish soap & new sponges. Fresh flowers and champagne/water compliments of host/owner!! Request for special services will be arranged. We have so many restaurants that are known to everyone like "Chilies" on Marble Falls Lake with great views or I recommend "Great Dam View" in Cottonwood with views of the lake and great food/drinks. We have another home in Port Aransas with a pool that sleeps 11! Great home called Blue Lagoon! Close to Old Town and 5 minute walk to beach. Horseshoe Bay Resort in Heart of Hill Country. Private Club but you can attend Resort for Dinner with Reservations or visit the Club 360 at Hotel or enjoy the Happy Hour at The Y Bar Tuesday thru Sat. Marble Falls on Main Street! Antiques, food, fun and art! Music at night and many other towns like Johnson City off Hwy 281 into Hwy 290 takes your group into the heart of our wine country/shopping! Clean moving water out the back doors of the home! :) Swimming, bobbing, & fishing at back door. 1. Horseshoe Bay Yatch Club (Lake Beach Front) 2. Quail Point (Large trees with shade, tables & beach for shade and shallow swimming for little ones. Deep water backyard for swimming and watching sun sets. Kids can swim while Granny watches. Heart of activity and action in your backyard. Indulge or just relax. Pretty views of water and hills! Out the back door past the "NO WAKE" Buoy! Out the back door past the ?NO WAKE" Buoy! I have space for 4 cars. Large towel per adult and swim towels also! 1st story has table and chairs for 15 on deck outback. Floaters, tubes, and stick floats! Call 1st as each case is different. Usually don't allow pets but a few previous clients have proven honest and clean. With additional deposit of $200 I will take occasional pet. Great place to stay on LBJ! The property was more then we expected! Everything was nice and clean. We had everything we needed for our small vacation.The views from this property were awesome. The house was great overall. The property owner was more then helpful and very kind to us! Hope to rent here again in the future!! I am so glad your family and friends had a great vacation! Owner was very nice. House was great. I would stay again. Had a fantastic experience. Our family of 12 enjoyed our stay at your condo. Grandkids especially loved being just steps from the 10’ deep water. They had a blast swimming, playing on tubes and fishing off the back of our pontoon. Plenty of towels for everyone. We kept coolers on the bottom deck to keep from having to go back upstairs for drinks. Condo was clean and well maintained. Marjorie was on top of the issue we had and was a pleasure to work with. Thank you for allowing us to stay at your home. Louvera I am so happy your family made great vacation memories here at Horseshoe Bay Resort! I really enjoyed having you guys and the little grandchildren where so cute! Made me wish I was still young....brought back my own Lake memories! Your family was great and I appreciated the way you left my home too! What a bonus for me! Thank you and I hope you come again. Fall and Spring rates are a bonus! Weather is still great for swimming and fishing! Awesome weekend at lake LBJ! We had a group of 20 people, the house was able to accommodate that many - there is a bunk room downstairs, a little warm but fans made it bearable. There is only room for 4 cars to be parked at the actual condo, the other cars had to park out near the hotel, but not a far walk. There is a boat slip which was nice, and the back porch is basically a dock to the water. We did rent a boat and didn't realize how far away Splash rental is, I would suggest looking for something closer. Overall the property was perfect for what we needed and we all had a great time! Right on the water with a dock and shaded Boat Slip. We celebrated our 30th Family Reunion and had a ball. The neighbors were great and the water was fabulous. I loved that the house was so close to the water and boat. It was really easy to load coolers to take onto the dock or boat, swim, fish or just relax within the shaded porch. There were plenty of chairs for just lounging around the dock too. We had plenty of beds for everybody and enjoyed the upper balcony equipped with an awning and a bar complete with stools, to just hang out and watch all the activity below (especially the fish light action at night). Marjorie was great throughout and I thoroughly enjoyed working with her. You are so easy to work with also! Your family was fabulous I'm so happy that you had wonderful memories and I wish you could come back to Texas again in the future! It's neat to see families come from all over to one place once a year and celebrate life! Thank you for respecting my home and taking care of all the rules that we requested! If your family decides they want to come back to Horseshoe Bay please think of me again! Twenty of us, from age 5 to 70 had a blast! HSB $1,000 WEEKENDS for 3 nights from Sept 8th till April30th.! WATER IS CLEAN/DEEP/GREAT! We are 1.5 Hours from either the Austin or San Antonio Airports. Marble Falls is 5 miles down the road. Everything is here for water activities, wineries, restaurants, shopping, mountain climbing, kayaking, fishing. This is a Self Catering home so you can feel at home and not go anywhere if you just want to relax by the water, watch TV, listen to music or read. It's your vacation or holiday home. Do what you like. I can help! I have repeat clients again and again! LONG TERM RENTALS AVAILABLE. Other Activities: Will Consider House Swap To Hawaii, Manly Australia, Tahoe, Carmel, Ski Destinations! Golf: We have 22 private/public facilities available in the area. My policy is firm. I ask 50% up front and balance within 60 days of rental. Home is booked through out the year and my property is well desired due to WATER, LOCATION, COMFORT & CONVIENCE. If there is an emergency and I can rebook your dates I return full payments to you. This is my business and I want you to be happy and return as most of my clients do. You have a choice of the refundable deposit $1,000 payable upon arrival and return the same day of departure or the non refundable of $59.00 These Holidays require a 3 night minimum - New Years, Spring Break, Memorial, 4th of July, Labor Day, Thanksgiving and Christmas. Thank you for your interest in my home!